In recent years, there have been a spate of autonomous vehicular technologies with a variety of reactive and responsive features that aim to enhance the convenience and safety of drivers and the passengers. The increasing incorporation of advanced driver-assistance systems (ADAS) has boosted the adoption of driver safety systems in cars of all types, including compact, mid-sized, and commercial vehicles. In various regions, increased government focus on improving the safety of passengers and reduce the rising road fatalities have led car makers to incorporate driver safety systems. The growing popularity of driver safety systems equipped with a variety of functionalities such as lane departure warning, blind spot warning, steering angle sensor, and heart rate-monitoring is accentuating the market. The demand for ADAS as a part of aftermarket solutions bodes well for the driver safety systems market. The growing demand for distraction monitoring systems in passenger cars in developed and developing regions is boosting the market. The market is expected to witness the adoption of driver safety system in cars from premium and luxury segments to those in compact and mid-sized vehicles, especially in developing and developed nations. 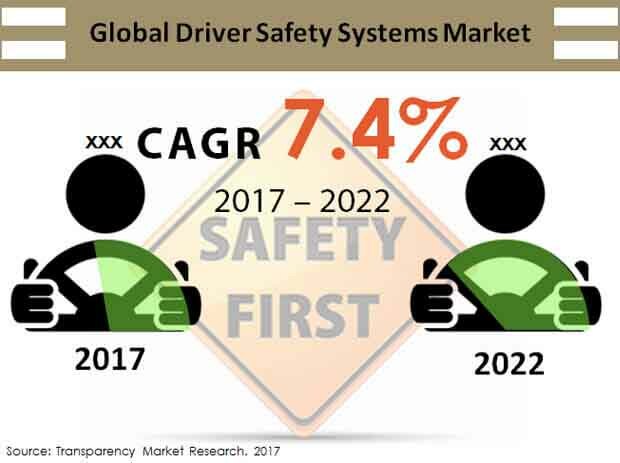 The global driver safety systems market is anticipated to be worth US$1,921.3 Mn by 2017 end and is projected to reach US$2,750.0 by the end of 2022. The market is anticipated to expand at a CAGR of 7.4% from 2017 to 2022. The various technologies used for driver safety systems comprise eye-tracking, facial expressions, heart rate-monitoring, steering angle sensor (SAS), and lane departure system. Of these, eye-tracking is projected to lead the technology segment and is expected to witness prevalent demand among car buyers. The segment valued at US$ 456.6 Mn, represent a share of 23.8% of the market by 2017 end. Rising at an impressive CAGR of 8.1% from 2017 to 2022, the eye-tracking technology segment is projected to reach US$673.7 Mn by the end of the forecast period, representing the share of 24.5% of the overall technology market. The annual growth is pegged at US$43.4 Mn annually during 2017–2022. The burgeoning demand for eye-tracking technology is attributed to the wide adoption of driver safety systems that focus on improving the awareness of drivers for a safe driving. The various regions for the market for driver safety systems are North America, the Middle East and Africa, Latin America, Asia Pacific excluding Japan (APEJ), Japan, and Europe. Of these, Asia Pacific excluding Japan (APEJ) is projected to hold the dominant share of the global market, vis-à-vis revenue, throughout the assessment period. The APEJ driver safety system market is projected to expand at a CAGR of 8.4% during 2017–2022 and gain 138 basis point, vis-à-vis market share, by 2022 end. The regional market is estimated to hold a revenue share of 30.2% of the market by the end of 2017. The increasing incorporation of driver safety systems in a growing number of passenger cars and their vastly rising demand in several emerging economies of the region are prominent factors boosting the regional market. North America is a prominent market for driver safety systems. The regional market is fueled by the extensive adoption of technologies featuring advanced driver-assistance systems in vehicles and the rising popularity of autonomous cars. In addition, stringent regulations on incorporating devices for improving the road safety has further bolstered the demand for driver safety systems. The regional market is projected to rise at a CAGR of 7.2% during 2017–2022 and reach a valuation of US$695.9 Mn by the end of the forecast period. Leading players operating in the in the driver safety systems market include Magna International Inc., Robert Bosch GmbH, Smart Eye AB, Seeing Machines, Valeo S.A., Continental AG, Denso Corporation, and Infineon Technologies AG. Several technology players are developing advanced systems with innovative features, in a move to gain a competitive edge over others. The report on the global driver safety systems market offers elaborate assessment into key growth dynamics, current and emerging technological trends, automotive production and sales in various regions, and prominent opportunities. The study provides a critical evaluation of the factors affecting the cost structure and pricing analysis of various segments. Employing business methods such as PESTLE Analysis, the study delves deeper into assessing the operating environment in major regions. The study takes a closer look at key participants through intensity map. The evidence-based findings help stakeholders identify imminent investment pockets. The research offers insights into the share and size of various technology, vehicle, and sales channel segments during the historical period of 2012–2016 across regions and offers projections of the market sizing during the forecast period (2017–2022). Expanding at a CAGR of 7.4% from 2017 to 2022, the global driver safety systems market is anticipated to reach a valuation of US$2,750.0 by the end of the assessment period. The estimated valuation of the market is projected to be US$1,921.3 Mn by 2017 end. The report provides in-depth insights into key drivers and restraining factors, notable trends and lucrative avenues, major technological advancements, and competitive landscape. The research presents a comparative analysis of the growth trajectory of the various segments by analyzing year-over-year (YoY) growth statistics during the historical period. The report evaluates key factors impacting the growth of prominent regional markets and notable opportunities in various technology and vehicle segments in these markets. The growing demand for devices with reactive and responsive features to improve the safety of drivers and passengers among car buyers is a key factor bolstering the demand for driver safety systems. The rising adoption of ADAS in passenger cars in various developing and developed regions is a key trend boosting the market. A burgeoning electronics automotive market is a notable trend accentuating the market. In addition, significant focus of aftermarket players on advanced driver-assistance systems in several emerging markets is expected to open up exciting avenues in the coming years. The report segments the market on the basis of technology, vehicle type, sales channel, and region. On the basis of technology, the research segments the market into eye-tracking, facial expressions, heart rate-monitoring, steering angle sensor (SAS), and lane departure system. Of these, the eye-tracking segment leads the market, currently holding the major share and is expected to maintain its lead throughout the forecast period. On the basis of vehicle type, the report segments the market into compact, mid-sized, premium, luxury, commercial vehicle, and heavy commercial. Based on sales channel, the study bifurcates the overall market into OEM and aftermarket. The various regional markets for driver safety systems analyzed in the study are Latin America, North America, the Middle East and Africa (MEA), Europe, Asia Pacific excluding Japan (APEJ), and Japan. Of these, the APEJ is the most attractive market holding the major revenue share of the global market. The regional market is anticipated to retain its dominance throughout the assessment period. This is primarily attributed to a burgeoning passengers market in several emerging economies and the rising adoption of ADAS in vehicles in numerous developed nations. The study elaborate profiles key market players and offers their projections regarding their revenue share during the forecast period. The report evaluates key strategies adopted by them to consolidate their shares in various regions. Some of the key players profiled in the report are Magna International Inc., Robert Bosch GmbH, Smart Eye AB, Seeing Machines, Valeo S.A., Continental AG, Denso Corporation, and Infineon Technologies AG.